Asia’s only great ape, the orang-utan or ‘man of the forest’ is found only on the islands of Borneo and Sumatra. Globally classified as endangered due to their habitat being destroyed, fragmented and poaching, orang-utans in Malaysia (Sabah and Sarawak) are probably best classed as ‘vulnerable’. Much of their prime habitat has been converted to plantations and the rate of habitat loss has hit a very low level in recent years. There is almost no hunting of this species in Malaysia, and most of the remaining populations are found in forests that are protected or under natural forest management. 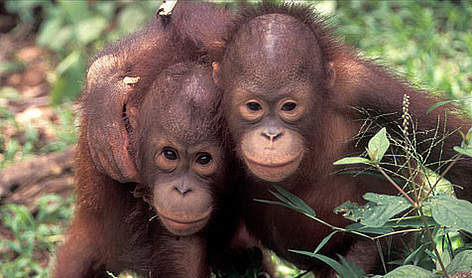 Orang-utans in the Malaysian states of Sabah and Sarawak occur mainly in the lowlands. In Sarawak, there are about 1,300 orang-utans, almost all in the Lanjak-Entimau Wildlife Sanctuary and Batang Ai National Park in the south next to West Kalimantan, Indonesia. In Sabah, there were five main areas of special importance with a total of 20,000 orang-utans in the mid 1980s (by WWF-Malaysia working with the Sabah Forestry Department, 1986). By 2004, the orang-utan population in Sabah had dropped to about 11,000 individuals (by Kinabatangan Orang-utan Conservation Project working with Sabah Wildlife Department, 2003). This decline in their numbers in the last twenty years was caused by planned conversion of forests to plantations in the eastern lowlands. Orang-utans generally have brown and rust-coloured shaggy fur. Weighing in at an average of 50 kg, female orang-utans grow to about 1.1 m in height and weigh 30 - 50 kg. Males weigh 50-90 kg and stand 1.2 - 1.5 m tall. Imagine sleeping 2 storeys and above up in the trees every night. The arboreal orang-utan lives up in trees where they bend twigs and small branches together to make a large nest-platform for sleeping. They are the largest tree dwelling mammal in the world. Adult orang-utans are solitary, except during mating. Orang-utans are not territorial, maintaining a loose relationship in a given area although adult males are hostile to one another. Crowding may cause them to fight over the limited supply of fruits. An adult female gives birth about once every six years. Omnivorous, orang-utans eat both plants and animals but feed mainly on fruits, young leaves, bark and insects. By about the age of ten, an orang-utan can recognise over 200 different food plants. The orang-utan’s favourite food is fruit. Orang-utans in Sabah and Sarawak live mainly in lowland rainforests but are also found in tropical, swamp and mountain forests. Sarawak has about 1,300 orang-utans, almost all in the Lanjak-Entimau Wildlife Sanctuary and Batang Ai National Park to the south bordering West Kalimantan, Indonesia. In Sabah, there are about 11,000 individuals today, the population having declined by over 40% in the last 20 years due mainly to planned conversion of forests to plantations in the eastern lowlands. Drought and forest fires, especially during the El Nino events of 1982-83 and 1997-98, but also 1987 and 1991, contributed to the decline. Wild orang-utan populations need a reliable source of a variety of fruits and young leaves to survive. They can survive only in extensive natural forests. The availability of food all year round means not all forests can support long-term breeding populations. We now know that this gentle ape can survive only in lowlands - where fertile soils and constant water availability allow steady food production - or where there are several forest types with different fruiting and leaf-producing seasons. There is little point in putting orang-utans where they have historically not existed, as lack of food supply may eventually cause them to die. There are six areas in Malaysia with quite large populations but this does not mean that any one of these places is unimportant. There is always the risk that one or more populations could be devastated by disease, drought or fires. Maintaining natural forests with viable wild breeding populations and restoring degraded forests is vital for the continued survival of orang-utans in Malaysia. Hence, the Sabah government’s initiative to retain the largest orang-utan population in the Ulu Segama-Malua Forest Reserves under sustainable forest management (SFM) deserves full support. The Deramakot forest management model, which produces controlled amounts of timber for international auction, certified according to international standards since 1997, shows what can be done. SFM could reduce forest damage and provide enough time for the forest to regenerate. In SFM, reforestation is necessary to ensure the forest rehabilitation or restoration take place in any sustainably managed forest. In the Lower Kinabatangan, various isolated forest patches need to be joined through restoration.